SAN DIEGO – Capt. Dennis Jacko relieved Capt. Harold Workman as commanding officer of San Antonio-class amphibious transport dock ship USS Anchorage (LPD 23) during a ceremony at Naval Base San Diego on July 10. During his time on Anchorage, Workman led the crew through certification events for Air Warfare, Surface Warfare, Electronic Warfare, Intelligence, Undersea Warfare and Navigation. Workman is a native of Minersville, Pa., He is a 1990 U.S. Naval Academy graduate (B.S. Mathematics), a 1996 Naval Postgraduate School graduate (M.S. Operations Research) and a 2008 National War College Distinguished Graduate (M.S. National Security Strategy). Workman’s sea duty assignments span five ship classes and both coasts. Jacko, a native of Sayreville, N.J., is a 1994 graduate of the U.S. Merchant Marine Academy at Kings Point, N.Y. He has served on six other warships. Jacko’s arrival to Anchorage returns him to command of a San Antonio-class LPD. He previously had command of USS New Orleans (LPD 18) in 2011-2012. Anchorage was built at the Huntington Ingalls Shipbuilding site in Avondale, La. and is the seventh San Antonio-class amphibious transport dock ship. The ship was delivered to the U.S. Navy on Sept. 17, 2012, and was commissioned on May 4, 2013 in Anchorage, Alaska, the city for which the ship was named. 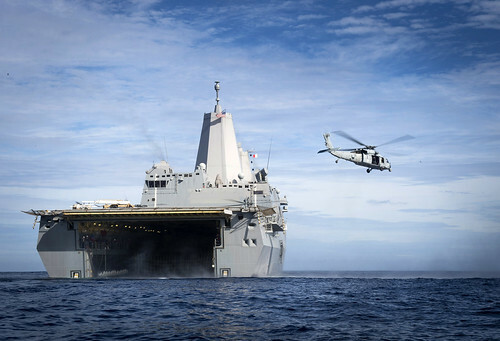 The ship’s primary mission is to embark, transport and land elements of a U.S. Marine Corps expeditionary unit for a variety of expeditionary and special operations missions using amphibious assault vehicles (AAVs), landing craft air cushion (LCAC), tilt-rotor MV-22 Ospreys and various helicopters. Anchorage is assigned to Amphibious Squadron One and Expeditionary Strike Group Three. The ship is currently homeported in San Diego, California.